I'm so excited to be sharing Modern Quilts from the Blogging Universe with you today as part of the big blog hop celebrating its release. The book contains nineteen projects from eighteen designers, and I'm incredibly honored to be a part of such an esteemed group of modern quilters. My Silo quilt, complete with full instructions, is included in the book, and I have to say, this is one my of favorite projects to date. I love that it's really unique and that it's design was inspired by something so mundane as a silo. I actually just received the quilt back from the great folks at Martingale last week to use in my Creativebug shoot this past weekend, and it was really fun to see it hanging in front of some large, metal silos near my house. You can read more about my Silo quilt, which was chosen as a winner in the fourth Project Modern Challenge by Denyse Schmidt, here and here. Modern Quilts from the Blogging Universe is full of amazingly gorgeous quilts, and here are some of my favorites. 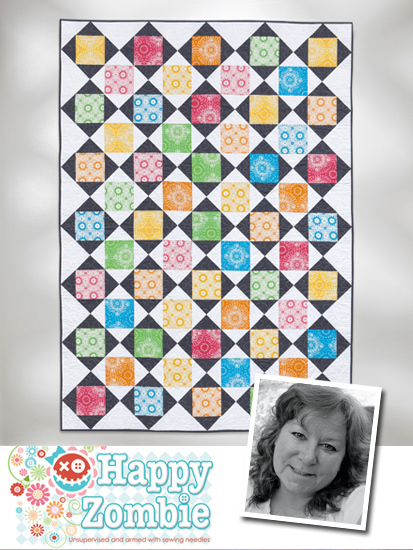 I love Katy Jones' Indian Summer quilt, which is modern spin on the traditional Dresden plate design. The hot pink sets off the Dresden plates perfectly. Monica Solorio-Snow's quilt is called Juicy, and it certainly is with the gorgeous pops of color that are grounded with dark gray and white. It's really stunning. John Adams designed a quilt called "A Shift in Perspective" and I really love his use of color. It is really bold and graphic and has an incredible sense of movement. I love the minimalist feeling in Jessica Kovach's "Petal Pod." The combination of the large quantity of gray negative space is the perfect way to accentuate the prints in the pods. Gorgeous! 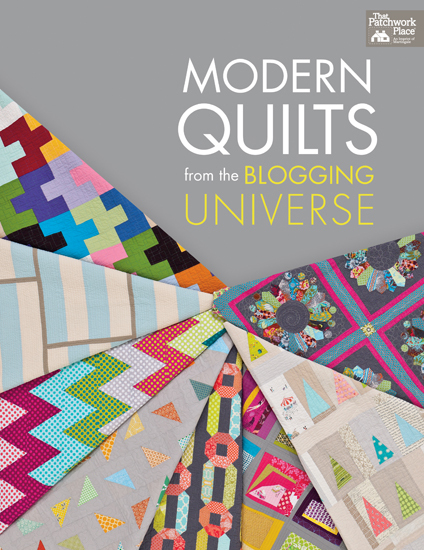 Modern Quilts from the Blogging Universe is a must-have-book for any crafter's library, and I'm so excited to be giving away an e-copy for one of my readers. Just leave a comment below and I'll choose one random winner. The giveaway closes on January 29, 2013 at midnight ET. Good luck! Please be sure to read more about the book on Martingale's blog, and visit all of the other designers who are participating in the blog hop and giveaway as well. P.S. Please be sure to leave your email address in your comment if it's not connected to your blogger profile. Thank you!! How exciting! Your quilt is gorgeous. Congratulations! The book looks fantastic and I can't wait to get my hands on it! Thanks for the chance to win! This ebook is very tempting ! Thanks for the chance to win ! I especially like 'Petal Pod'!! 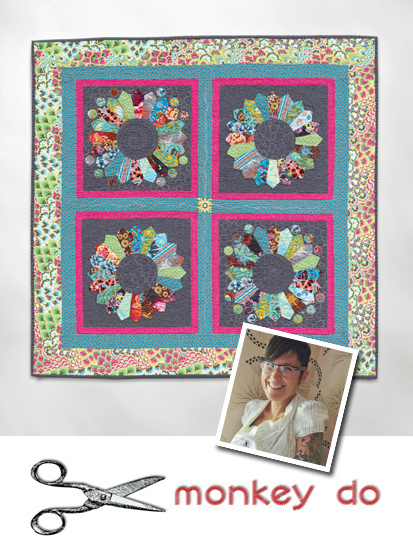 Looks like this book is full of gorgeous quilts, thanks for the chance to win! congratulations; lovely quilt! thanks for the chance. Not often do I come across a quilt book that I want to make EVERYTHING in it. Thanks for chance to win. wow...i want to make one of each & every quilt!!! your quilt is a lovely interpretation of the silo!! From what I've seen about this book around blogland (and I've seen a lot! ), I am drawn to just about every quilt that is included. Thank you for the chance to win! Love the simplicity of your quilt! The book looks great, I can't wait to have a closer look. Your quilt is so striking, great design! They are all simply lovely! So much inspiration, I don't know where to begin! Oh my gosh, I want this book! Thanks for the chance! Oh wow - what fun... this pretty much bombarded my Google Reader this morning, since these are all my favorite bloggers!! Yipee...a chance to win this awesome book. Thanks for the opportunity. Oh, would love to have this book! Nice for you to finally see your quilt in person again ... after showing the whole world. Cheers! This book looks like lots of fun. Happy to see petal pod in there. Modern quilt are so much fun! Great quilt. I love your understated color palette. Thanks! Love Petal Pod - I would love to make that one!! Fab giveaway - I've never seen a quilt book on an e-reader. Thanks for the chance!! The book looks fantastic! Thanks for the chance to win. The book looks fantastic - what a great collection of talent! Love the idea behind the book!!! Congratulations to all on this book. It looks great. Thanks for the chance to win the ebook. I've been wanting this. Clearly I should stop buying fabric and start buying quilty books for inspiration! How fun - I'd love a copy! What a great book! Thanks for the chance. Estou na "minha torcida...quero ganhar.Vou fazer uma de cada família aumentando...Obrigada. Your silo quilt is one of my all time favorites and this book was on my Christmas list, but I didn't get it. I would love to win!! . So many wonderful quilts. Thanks for the chance. I would love to make some of these quilts! Great quilts! My favourite from the ones you showed is Juicy though yours is lovely, too :). Thanks for arranging the giveaway, it's a great looking book. It must be an exciting project to be part of. 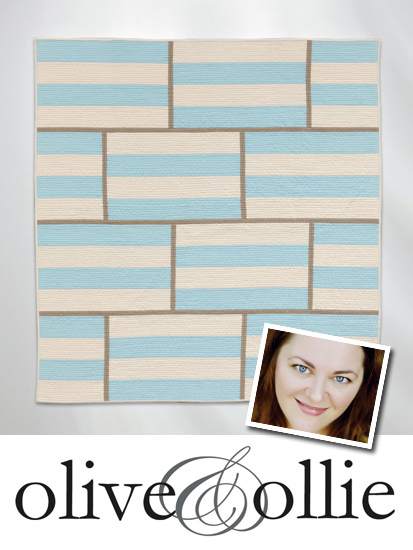 A great simple quilt pattern-love it! Thanks for the chance to win the book. What a beautiful book, I just love the quilts in it! Thanks for the giveaway! Congrats on being in the book. What a great feeling that must be! I LOVE your silo quilt!!! Crongrats. Looks like a great book. Thanks for the chance to win. I love all of the quilts in this book. Thanks for the giveaway. Love the simplicity of your silo quilt. Well done. 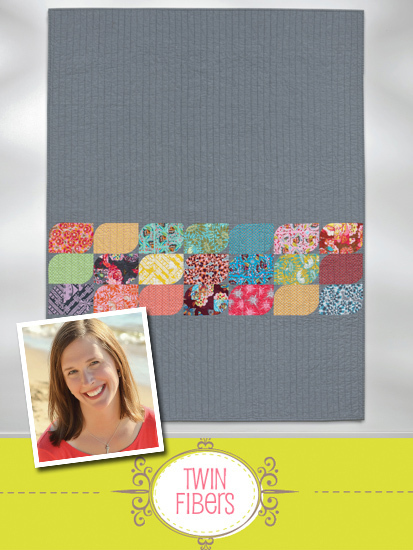 This must be truly exciting for you to have your quilt published. The preview of the book is great and inspiring. Thanks for sharing. ooops! That wasn't a comment! The book looks wonderful and your quilt is gorgeous! Exciting! Great quilt - the colors are so peaceful. You surely have the eye of an artist! I love seeing how the silo inspired you! 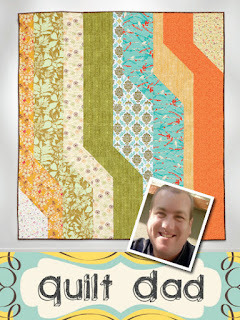 great quilt and fun photo shoot site! Wow, I love your quilt. Congrats on making the book. Wow - this is so VERY different. Well done on being included in this awesome book. Your quilt is really fun! This looks like a fun book to have. Looks like such a fun book - thanks for the chance to win. The book looks wonderful! I'd love to be able to see the whole thing! Maybe I'll win! Congrats on being published! This book looks great! What a lovely calming quilt! Love your quilt! Can't wait to see the book. Thanks for a chance to win. I absolutely LOVE the simplicity of the Petal Pod pattern! I love the simplicity of your quilt. Can't wait to see this book. This book looks truly awesome. I love visiting all of your blogs too! Hope to win the book. The more I travel through the blogs, the more I want this book, and the longer my "in my mind" quilt list gets! It looks like a fabulous book! Love modern quilting and would love a copy of this awesome book. Photographing your quilt next to a silo is genius!!! While our farm doesn't have a silo, there are many around the area...and your quilt looks just like them! Awesome!!! On my list!!! Congratulations on being included in such a great looking book! I have had this book on my wish list!! This beautiful book has so many lovely projects. Congratulations and thank you for chance of winning a copy. I would love to try some of the quilts in this book. Thanks! I'm taking my chance. Thanks. This book has so many possibilities - consider me inspired!! Would be thrilled to win! Thanks so much! You did a great job on your quilt. Yay for getting in the book! Fantastic book! Adding it to my wishlist! Count me in, this book looks awesome! I would love to win! The book looks great! Love the quilt and the chance to win the ebook! Congrats for being on the book!!! Terrific quilt. I love this book! Congrats! I can't wait to get a copy! So excited. Thanks for the chance. I LOVE the photo of your quilt! Rustic and refined all at the same time. Brilliant! It's nice to see a simple quilt with clean lines! Congratulations on having your quilt included in the book. Your quilt is lovely. Thanks for the chance to win a copy of the book. The book looks cool and I really like your quilt! Thanks for the giveaway. Love your quilt and would love a copy of this book! Thanks! A very interesting quilt, and a fantastic book! I like that there is so many different things going on and so much to learn and try in this book. Thanks for the giveaway!! Congratulations! I'd love to win this book! Thanks for the chance! Thanks for the chance to win! The book looks great! Thanks for the chance to win this beautiful book!! Book looks very good. Good blog. Loved your quilt! Thanks for the opportunity to enter the giveaway! Love your quilt, and Quilt Dad's is another favorite. Looks like a wonderful collection in this book! Thanks for the chance to win a copy of the book, I can't wait to get my hands on a copy! What a fantastic book!! Thanks for the opportunity! What a great book! Congratulations on being included! The book looks like so much fun! I would love to have one! How exciting. What an amazing group of quilts. Congrats and thanks for the chance to win. Lovely collection of quilts, Congrats on the book! I'd love to win a copy. I love your quilt. Thanks for the chance. Looks like an amazing book. Can't wait to see it. Thanks for the giveaway! I'd love to have a copy of this book. This looks like a real treasure, full of very interesting and different quilts. Love your stitching, too! Congratulations on being included in such a great book and thanks for the giveaway! Love this book! Thanks for the chance to win. This book really speaks to how popular and wonderful the quilting blog-land is these days. Love it! I have been quilting since 1986 and I find myself drawn more and more to the "Modern" quilt style. I would love to win this book!! Wow, I would love to win this book. Thankyou for the opportunity. It is amazing how the quilting design can change the whole look of a quilt. I would love to win the book. Congratulations! What a great looking book - I would love to win a copy, thank. You for the chance! I would love to win this book. Thanks for a chance. such a darling design you did. Fabulous quilt. Thanks for the giveaway. Fabulous quilt, and so cool that the silos inspired you! Congrats on your good going! I love using things around us for inspiration! Great quilt...can't wait to start another one soon. Congrats on your entry!! A FAB quilt. Thanks for the chance to win! It's amazing how, after we've been quilting for awhile, many of the things we see around us create possibilities for quilts! Yours is great. Congrats on being included in this book, which has been on my Wish List. It would be great to win this book to use as a giveaway at one of our new MQG chapter meetings, here in Central Florida. Thanks for the chance! This looks like an awesome book! Thanks for the chance! Congrats on your Silo quilt...I really like the picture of it with an actual silo. Great quilts! Thanks for the chance. Beautiful quilt. It is soothing to look at. Such a great group of bloggers and wonderful creations! Thanks for the chance to win! This book looks great! Congratulations on your inclusion. Would love to win a copy of this super book. Thanks! I am pretty sure I could find something to make out of this book! What a cool idea to create a quilt inspired by a silo. I am having fun learning the stories behind the quilts. Thanks for the opportunity to win this wonderful book. Loving the quilts in this great book. I'd love a freebie, but I'm willing to pay for it otherwise! Awesome collection of quilts! It's at the top of my wish list! Thanks to the chance to win the book. Gorgeous! So simple and pure and ... gorgeous. Can't wait to make a few. Thanks for the chance to win. I love this book. Congrats! This book looks fun, I can't wait to get into my hands! It looks like a great book! Thanks for the chance to win a copy. I think the silo quilt will go well at our local fair located in rural Michigan about 40 minutes SW of our state capital...in other words...out here in the boonies. Great addition to this wonderful book! Congratulations on a lovely graphic quilt in a beautiful collection. these are all such wonderful quilts!